THE already hyper-competitive accounting software market just got more interesting. Wolters Kluwer Tax & Accounting has launched CCH iFirm Tax, Canada’s first cloud-based professional tax software for accountants, bookkeepers and tax professionals. iFirm Tax is powered by Taxprep and is a native cloud application that allows tax preparers to work from anywhere, on any device. According to a recent survey, global revenue for the accounting software market was valued at $8.9 billion in 2016 and is expected to generate revenue of $15.1 billion by the end of 2022. While companies like Microsoft, Sage, and SAP continue to dominate the market, it seems like cloud and app-based newcomers are joining the market on a daily basis. Now CCH iFirm Tax is changing the game in Canada. CCH iFirm Tax is an application that is part of the CCH iFirm ecosystem, which is built around a centralized client database that provides the benefits of working securely online, at the speed of the desktop. 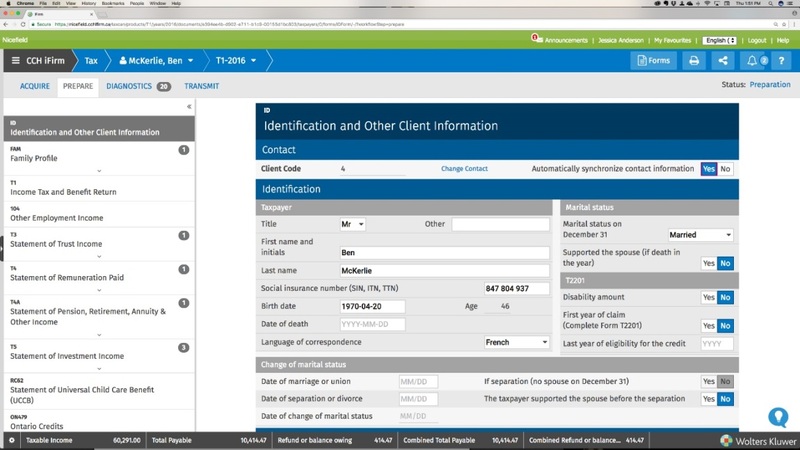 The iFirm portal is included with a subscription to iFirm Tax. The program is hosted entirely in Canada and features 256-bit AES encryption at rest and encrypts data from the desktop using 256-bit TLS 1.2 before it is uploaded to the servers. One hundred firms participated in a trial of the program during the recent tax season. A total of 2,500 T1 returns were prepared, and 1,600 returns were filed. The feedback from the participants was positive and they reported that learning to use the program was straight forward. The program includes all the features of Cantax and most of the features of Taxprep, except for some of Taxprep’s advanced features, such as custom diagnostics, and the creation of forms filed from the T1/T2/T3 file. That functionality will come with a future update. The interface is clean and has been built from the ground up to be intuitive and works well with tablets and screens of all sizes. The software is always up-to-date and features Taxprep’s diagnostics. The screen refreshes are remarkably fast for a cloud-based program. Data entry and calculations are done on the desktop and then uploaded in the background. It includes CRA AutoFill capabilities, immediate form display, and real-time tax calculation. Data can be exported to other software. One of the barriers that publishers face in releasing new software programs to accountants is resistance to change. As one CPA told me, “the only thing more complicated than tax is tax software.” Steep learning curves often mean that many tax professionals choose one program and generally stick to it for life. iFirm Tax is aimed towards tax preparers, from sole practitioners to large accounting firms, who prefer a SaaS solution and the benefits of the CCH iFirm ecosystem. Current Taxprep and Cantax subscribers are invited to try it out and upgrade. The T1 is now available for trial or to order. The French-Canadian version will be released in September. T2 will be available in November 2017 and the TP1 a month later. T3 and Forms are scheduled for the fall of 2018. The Planning Module will be available in 2018 as well. Scan currently does not integrate with CCH iFirm Tax but its roadmap includes the addition of applications in the near future to facilitate document scanning. From 2016 onwards you will be able to work in up to 10 years of tax files. If a firm cancels its subscription, it can export the current tax year file to a PDF or Taxprep file. The data will also remain available in the application for up to 60 days. CCH offers conversion of Cantax, Taxprep, ProFile and TaxCycle files. For now, since the forms available are for 2016, the company converts from 2015 to 2016. When the new versions of the forms are released, CCH will convert all future years but not prior to 2016. So, does Wolters Kluwer have a winner with the first cloud-based professional tax software in Canada? Well, according to the company’s own research, 90 per cent of the 3,000 CPAs it surveyed reported that the delivery of digital processes to clients would become a key differentiator among accounting firms in the next five years. Yet only eight per cent believed the profession is ready to make this change. From its features, ease of use, and speed of data refresh perspective, iFirm Tax works well. What Wolters Kluwer can’t control is the speed with which their Taxprep and Cantax clients are willing to move to the cloud. Only time can provide that answer. Alan Salmon is recognized as Canada’s leading analyst in accounting technology. As the founder of K2E Canada Inc., Alan has over 34 years of business, management systems, education and journalism experience.